Nominated for a second time in this category, the adorable Bethany Jillard (who was named one of our Performers of the Year last year) was the best thing about Stratford’s flagship 2012 production of Henry V, delivering a funny and tough performance almost entirely in French as Princess Catherine. One of our favourite actresses at the festival, Jillard was also an endearing Hero in the troubled Much Ado and is sure to be a standout Desdemona this coming season. 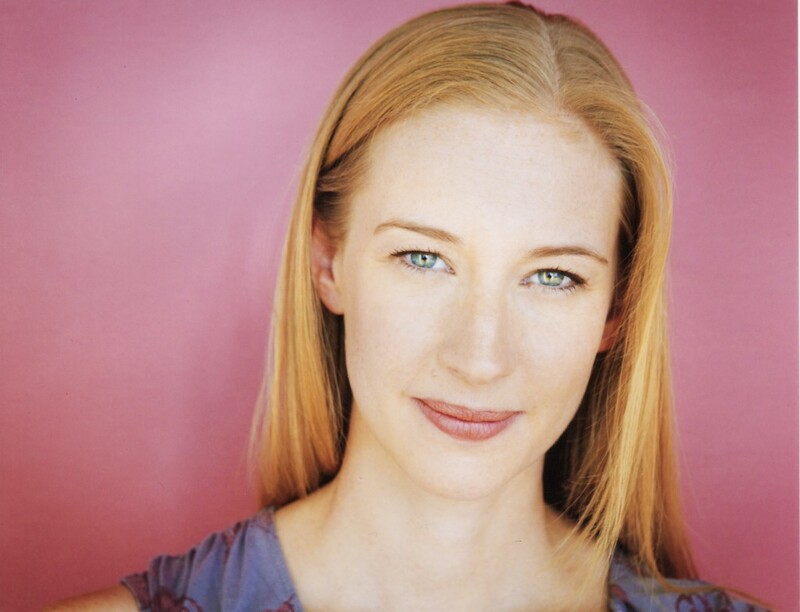 You can read Bethany’s 2011 interview HERE but the Best Supporting Actress in a Play nominee had even more to say about 2012, and we’re lucky enough to be on the receiving end of her thoughtful musings. You participated in this series last year after your nomination for The Little Years. What was it like revisiting that play for the Toronto remount? I was so grateful for the opportunity to revisit The Little Years. It was such a powerful piece to develop, rehearse and perform. And when we came back to it Chris Abraham (our director) really allowed us to discover the play anew – naturally our relationship with it would be different, given that it was a year later, we were going into a new space and there were new members in the cast. I appreciated that we didn’t simply try to recreate what we’d already done. The Little Years is a tricky piece in many ways – it requires a kind of subtlety and trust in the silences and spaces underneath and between what is said – and Chris was rigorous in helping us discover its honesty and depth for this particular production. I think the play found a good home at the Tarragon and I think or at least I hope that Toronto audiences responded to it as deeply as our Stratford audiences did. This year you’re up for another My Theatre Award, this time for Henry V. How did you feel about how that production turned out? 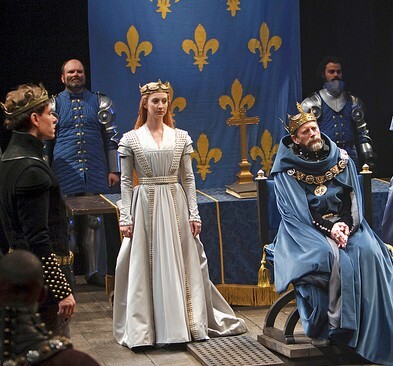 I loved our production of Henry V. Since Catherine was only in two scenes I was able to spend a great deal of time during tech watching it all come together. Our transition from rehearsal hall to the stage was significant – a drawbridge, scaffolding, giant flags, using the trap etc… a lot had to be integrated, but we had a solid foundation from rehearsal and an amazing cast, both of which grounded the tech process and allowed the heart of the story to live and be lifted as the final elements were added to the mix. I love in the prologue of Henry V how the audience members are asked to use their imaginations, to take what we say and transform what they see to create the epic scope of this incredible story. I was always inspired by the admission in that prologue that, without them we really couldn’t do it – that the partnership would be essential to the realization of the piece as a whole. I hope that audiences felt a bit of that connection, that kinship with us as the piece began. Was it interesting working with Des McAnuff on the last Shakespeare of his tenure as Artistic Director? Well at the time I don’t think we knew it would be his last or at least it didn’t figure in to the way we approached the piece. Certainly I was grateful to have the chance to work with Des on a Shakespeare before he left. It was exciting to be part of a play that he was directing for the first time – during the rehearsals for Catherine’s scenes there was a real sense of play, exploration and discovery. We didn’t know what their eventual shape would be – sometimes there was an image we knew we wanted to get to but it was a matter of building things appropriately to reach that point… like a puzzle. How was your dynamic with Aaron Krohn who played Henry? Aaron and I got along brilliantly right from day one. I sat beside him during the first read, laughing at the cartoons he drew in the margins of his script and listening to him bring Henry to life, immediately understanding why Des had chosen him to lead us through this play. I knew I had my work cut out for me, playing Kate to his Hal. Somehow, in one scene that took place three quarters of the way through the first act, I had to capture the audience enough that when I returned in the final scene of the play I’d be worthy of this amazing young King they’d spent the last several hours growing with/being charmed by. Thankfully and as per usual, Shakespeare knew what he was doing and once I could trust that, things started to fall into place. In the end we just had to play and live in that gorgeous final scene, which was a joy to do. I love that these two characters are “Catherine de Valois, Princess of France and Henry Plantagenet, King of England”, marrying for peace and political power AND, at the same time, they are simply Kate and Hal, looking for love, happiness and a true partner with whom to build a life. It’s a beautiful and complex dynamic to explore and I was lucky to do that with Aaron. I hope very much we have the chance to work together again sometime soon. Your other scene was with Deborah Hay who also played your cousin in Much Ado About Nothing. Did you two develop a rapport between the two shows? When we started rehearsals for Henry V we’d been working on Much Ado for I think a month already – we’d found friendship, trust, intimacy, joy and all that good stuff between Hero and Beatrice (and between ourselves really) – in some ways it was as simple as translating what we already had to suit this new dynamic between Catherine and Alice. 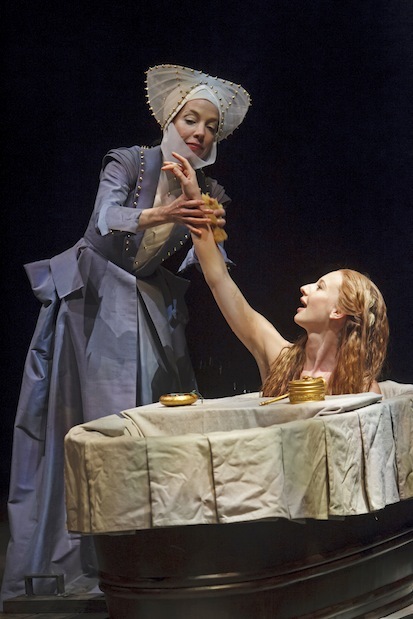 And I was so grateful to have that closeness with Deb because of course in our production we set the ‘English lesson’ scene during Catherine’s bath time. Before rehearsals started I had some reservations about being naked in a tub, about how that would work… but as soon as we started working on the scene, it made perfect sense. It was this beautiful stolen moment of feminine intimacy in a play dominated by men, war, politics… I don’t know if I could have done it, though, had Deb and I not established such an easy and honest affection and connection right from the get go. It would have been difficult to fake that kind of relationship – she was actually washing me every night… but there was something so lovely about living there together – the world was so small, so ordinary in that moment and it was all ours… I think it set up a striking contrast to when we finally see the two of them surrounded by all the pomp and circumstance of Court in the final scene – and yet, we know what’s really there beneath the crown and the fancy dresses and the ceremony because we saw them just living first. How’s your French now that you’ve done an entire Shakespeare role in it? Well… I am fluent in all the French that Catherine speaks! When I first accepted the role I had aspirations of being completely fluent by the time we opened. I worked through the first two levels of the Rosetta Stone program (which I thoroughly enjoyed) but then had to focus on the actual job at hand. It became less important for me to learn the entire French language than to learn what I had to know to live in Catherine. It was a wild challenge really – but I loved having something that was so completely ‘other’ to explore and find a home in. And there were a few beautiful French speakers in the cast so I had great support throughout. Now I’m working on completing the Rosetta Stone program and I can’t wait to visit France (soon?!) to put it all to use. Did you have a favourite moment in Henry V? So many!… I was lucky because, while Catherine is only in two scenes, they are both such brilliant scenes. I loved every moment. During the English lesson Alice is exasperated by Catherine’s inability to remember the word ‘elbow’. (Bilbow, d’ilbow… ‘d’elbow!’ ‘that’s what I said!’) When Catherine recites her list of English words for the last time, we decided she should make a real point of finally getting it right. So it always had a sense of play and attitude that was fun. Then one day (…because I was dared to) I grabbed Deb’s arm, said ‘d’ELBOW’ and then playfully bit it. It was ridiculous, but it was delightful – I felt like a scamp and most wonderful of all, it made Deb laugh. And we loved any time we surprised each other into a genuine laugh during that scene. During the wooing scene I always loved when Henry finally won. ‘Oh Kate… nice customs curtsy to great kings. Dear Kate, you and I cannot be confined within the weak list of a country’s fashion. We are the makers of manners Kate. Therefore patiently and yielding…’ I always knew, the moment I heard ‘Oh Kate…’ that she was done for – and I knew that she didn’t really mind one bit. 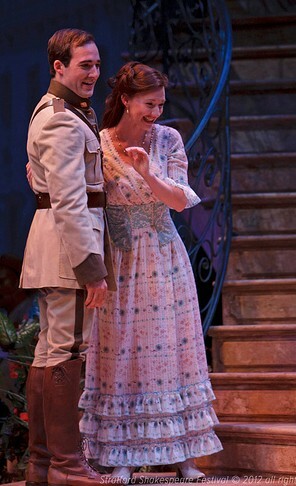 In Much Ado, you did a particularly good job of filling in the moments when you weren’t speaking. What were some of the details you brought to Hero that went beyond the text? Hero is such a great challenge for that kind of thing – it was a wonderful journey exploring the details that compose her silence. I never felt she was silent because she was weak or because she wasn’t thinking. It seemed to me that when she spoke she was so direct and showed such strength that her silence came because she understood the power of words and weighed each one carefully. She has wit and depth (after all, she’s spent her whole life hanging out with Beatrice!) but she doesn’t use it as a weapon in the same way other characters in the play do (except perhaps in the gulling scene). Also, she’s young – she’s watching the world, taking it all in and figuring out where she wants to fit into it. She needs to listen first and speak when she’s ready. Did you by any chance get to see Joss Whedon’s Much Ado when it was at TIFF? I didn’t get to, no… was it good?!? The Kenneth Branagh film was my first exposure to the play. I saw it when I was really young, 8 or 9. It made me wish I lived in Italy and I remember crying when her dad yelled at her, didn’t believe her, at the wedding. I saw everything in the 2012 season! It’s got to be one of the best perks of working at Stratford, being able to see all the other plays and appreciate the range and quality of work that colleagues and friends are doing all in one place. It’s hard to pick favourites because I think it was a very strong season overall and every show offered something unique and valuable. If I had to choose (and I’ll leave Much Ado and Henry V out of it because of course I’m terribly biased) I’d say The Matchmaker and Elektra. And Cymbeline and Wanderlust. The TPT [Tom Patterson Theatre] was a very good place to be in the audience last season. Besides the Little Years remount, what have you been doing in the offseason? I was out in Winnipeg playing Scarlett O’Hara opposite Tom McCamus’ Rhett Butler in MTC’s world premiere of Gone With The Wind. I can’t really find the words to describe how awesome that was… an incredibly thrilling, wild, challenging, fulfilling adventure. I desperately hope we have the opportunity to do it all again soon! You’re scheduled to be back this season as Constance in The Three Musketeers and Desdemona in Othello. Have you started thinking about those parts yet? Yep. Mostly just letting ideas, thoughts, feelings roll around inside. Dion [Johnstone] and I have chatted a bit about Desdemona and Othello – it’s been great to have a kind of informal dialogue going to begin exploring that relationship. I’ve been doing some reading. I had a costume fitting for Constance the other day – not surprisingly, her costumes are beautiful! I’m looking forward to getting into rehearsals – though at the moment I’m also appreciating the time off. This is the first time off I’ve had in over two years so my body and my voice need the r&r and I’m teaching myself to appreciate the virtues of a break. Stratford’s 2013 Othello will be about Graham Abbey convincing Dion Johnstone (aka one of the nicest guys in theatre) that you, of all people, are morally corrupt and philandering enough that you deserve to be murdered. The only strategy I can think of that might work is mind control- is Graham Abbey an evil wizard? [Laughs]. I hope so. A little Voldemort meets Iago would shake things up brilliantly I think. Thank you for the chance to chat about all this and of course for the nomination – it’s an honour to be acknowledged for a piece that was so close to my heart.